Liverpool's ambitions this season far exceed FA Cup glory, but that didn't make a dreadful performance at Wolves any less painful. The home side could, in truth, have put Liverpool to the sword in the first half, but they ultimately had James Milner to thank for their opener after a terrible error in midfield set Raul Jimenez away. Divock Origi hauled the Reds level with a superb effort from the edge of the box, only for Ruben Neves to go one better and dump his known admirers out of the cup. Liverpool's third round exit follows defeat at the first hurdle in the Carabao Cup last September. They have now won only one domestic cup game in the past two seasons. The defeat itself should not come as too much of a surprise to Liverpool fans. 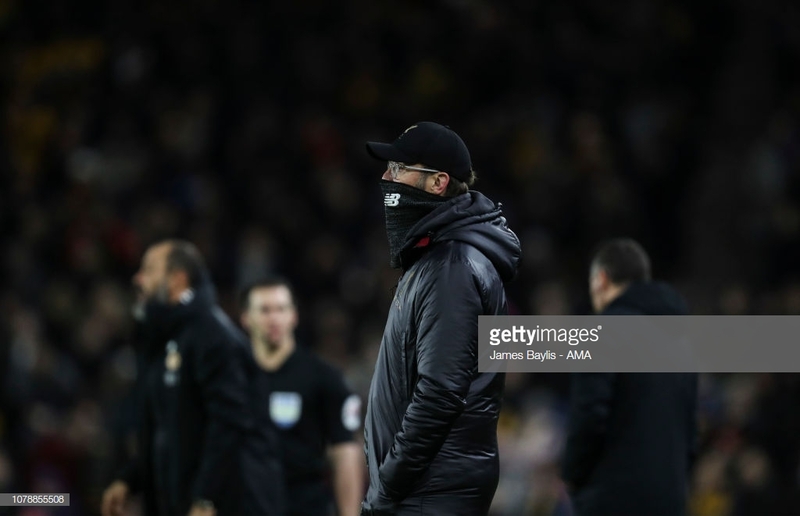 As Jurgen Klopp rang the changes, opposite number Nuno sent out a near full-strength eleven, effectively wiping out the gulf in class which usually exists between the two sides. Liverpool's team included three debutants born after 2000, a makeshift centre-half and a hark back to the dark days in the form of Simon Mignolet and Alberto Moreno. The result was plenty of space for Wolves in the final third and a total lack of fluidity. With Sadio Mane, Mohamed Salah and Roberto Firmino all starting as substitutes, Liverpool's attack looked decidedly blunt. Klopp will have been bitterly disappointed by his side's meek showing, but he will also, privately, see the positives. The Reds have bought themselves some valuable two-week breaks later in the season when the title race intensifies. In the past, he has taken the opportunity to jet off to southern Europe for a warm-weather training camp. Klopp doesn't have to worry about risking his big players in later rounds and potentially damaging Liverpool's bid for the top prizes. The result is bound to be construed as a big blow for the German, trophyless at Anfield as yet, but his team have bigger fish to fry this season. Xherdan Shaqiri and Naby Keita were the two names that stood out on the unfamiliar Liverpool teamsheet. They were Klopp's difference-makers. Shaqiri, who has dazzled on several occasions in the league, was largely anonymous in a first half bereft of the ingenuity he was tasked with providing. He enjoyed more possession after the break, but too often he conceded it easily. Perhaps, given he was excruciatingly close to scoring a sensational free-kick, it just wasn't his night. Concerns about fellow summer signing Keita run deeper. The Guinean has struggled to build any momentum, in part due to injuries, and struggled when handed an opportunity to impress here. There were plenty of nice touches, but the end product was lacking, with an inexplicably overhit ball to a well-placed Salah in the second half summing it up. Still fans eagerly await the moment when he comes to life. A notable positive was the impressive performance of 16-year-old Ki-Jana Hoever, thrust into the spotlight early doors when Dejan Lovren was forced off injured. Klopp reportedly allowed Nathaniel Clyne to join Bournemouth on loan because he believed Hoever could deliver if called upon, and at Molineux the teenager justified his manager's gamble. There were one or two shaky moments - Jimenez very nearly dispossessed him and scored - but for the most part he outdid several of his more experienced team-mates and exhibited intelligence and ambition. Remember the name. Meanwhile, Rafa Camacho was unable to build on the promise he showed in the opening minutes, and Curtis Jones, who excited fans in pre-season, failed to make an impact. Klopp told reporters in the lead-up to this game that he was unlikely to dip into the market in this transfer window, but his hand may be forced if Lovren's injury proves to be serious, with his other experienced centre-halves, Joe Gomez and Joel Matip, both sidelined at the moment. Then, come the summer, he may feel compelled to add real strength-in-depth to his squad. Moreno, Sturridge and Origi will all have been frustrated with their lack of opportunities this season, but although the latter managed to score, not one of the three boosted their prospects of regular gametime, which were slim from the outset. If Klopp wants to sustain the challenge he has presented to Manchester City, he may need to add more players who can really compete for places rather than merely deputise.